You may have listened to your unborn baby’s heartbeat when you went for a scan and wished that you could repeat the experience at home. There are several baby monitors available that allow you to listen to your baby’s heartbeat so you and your partner can share the experience many times as your baby grows. You don’t have to wait for the next doctor’s appointment to hear your baby’s heartbeat. In this review we look at The Wusic Womb heartbeat baby monitor. It is a compact lightweight little device. It is a non-invasive way of listening to your unborn baby’s heartbeat and is safe to use. It comes with two sets of earbuds so you can listen with your spouse or other family members. It has Ultra-Clear audio sounds and adjustable volume control. It has 6 hours of battery life with an LED to indicate when it is on or off. It also offers a download of lullaby music. The Wusic baby heartbeat monitor also has a computer cable so you will be able to record the sounds you listen to. Butlet’s take a closer look at some of the pros and cons of this heartbeat baby monitor so you can decide if this is the device for you. This Wusic baby heartbeat monitor is a great way to keep the worries of first time parents away. It has quite a few positive aspects going for it. It will help put your mind at ease to listen to your baby’s heartbeat every week or so. It is best to use this at around sixteen weeks into the pregnancy when the heartbeat is strong and you can pick it up most clearly, but it has a helpful instruction manual to help you position it correctly at each stage of your pregnancy. The downloadable lullaby album is a nice addition. You can even personalize it with your baby’s own name. You can put your mind at ease, or give this as a present to a newly pregnant couple. You can also really bond with baby and your partner by listening to the heartbeat together with the comfortable earbuds. Just keep in mind that it is not a medical device and if you don’t pick up a heartbeat it does not necessarily mean you should start to obsess about it. On the negative side you should keep in mind that you should not use for more than 10 minutes at a time. It also does not have a display for the heartbeat and it doesn’t give you the beats per minute, so you will need to rely on your own counting skills to keep track of the heart rate. It can be a little difficult to pick up the baby’s heartbeat clearly and not pick up only your own. It does not have speakers so you will need to use the earbuds at all times. Even though it is very lightweight, it can be a little difficult to hold, so you might need to ask someone to help you. It is reasonably priced, but you will need to buy additional gel for it to work properly. In this quick review we took a closer look at the Wusic baby heartbeat monitor. 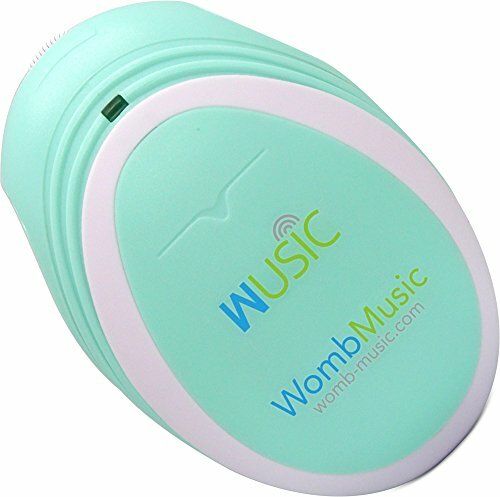 It is a great product for first time parents who want to have the added peace of mind to listen to their baby’s heartbeat. It is compact and lightweight and reasonably priced for the benefits it will give you. It will make a great gift and will also be a way of including your partner in the experience because you can listen together. Like we said earlier, just remember that this is not a replacement for a doctor’s visit, and if you don’t hear a heartbeat it could just be the monitor is not working well. Always consult your physician first. We can really recommend this product if you want to have a close connection to your little one from early on. If you need peace of mind you will regret buying this little monitor and listen to your baby grow stronger each week.